What's the difference between pedelecs and e-bikes? There are two styles of propulsion methods. Pedelecs are electric bicycles that must be pedaled. 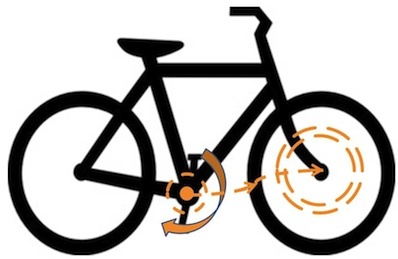 Pedal assist work automatically when you start pedaling. The motor assistance will come on to assist you only when you pedal. It will make pedaling really easy, you will fell like cycling with constant tail wind. 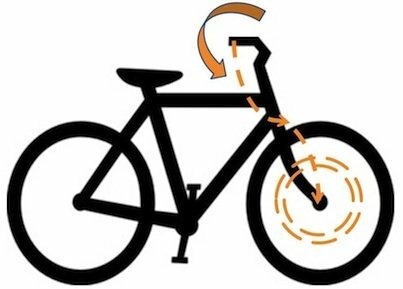 The motor will automatically turned off when you stop pedaling or press on the brake. There is simply no throttle present. You do not need to switch anything or power-on anything. In principle, the pedal assist bicycle is usually more protective to the battery and it's riding range is longer then throttled-based e-bikes. The Pedelec was developed due to regulation of some countries (i.e. European Nation). It's control mechanism is much more complicated then that of the power-on-demand e-bikes. It's electronic circuitry include an advanced pedal torque sensor (motion sensing) which measure the amount of human power and advanced computer chip that handle the pedaling data and ultimately send the calculated data to the motor. Overall, the pedelec has a similar behavior to a standard bicycle with pedals. It just that there is a motor that augment your power (and not replace it). You don't need to switch on a throttle so the riding feels very normal and you don't need to use your wrists all the time. 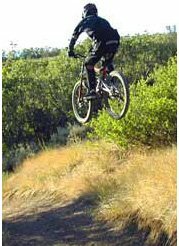 The pedal assisted bicycles usually let you adjust the level of assistance that you are going to receive as you pedal. The level of assistance is determined by using the console. The amount of assistance can be ranged from no assistance at all to a great deal of assistance (the maximum level of assistance may depend on the regulations). Behind a certain speed, the motor assistance is usually cut out. In the European Nation this speed is 25 km/h. In my opinion, this specific restriction is very limiting and need to be reconsidered. 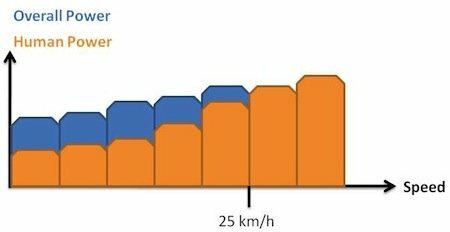 Most of the bicycle riders can reach speed higher then 25 km/h for a limited time without a lot of effort. Raising the maximum assistance speed (along with other minor changes to the law) will bring more people to consider using e-bikes instead of cars. In contrast to pedelec, No pedaling required!. The pedals and the motor are independent of each other so you can pedal as much or as little as you like. The more pedaling, the greater the speed and the longer the range. E-bikes are designed to augment human power, but the power-on-demand bikes allows to you to bypass this rule. Cruise along without pedaling - ride just by pure motor power. Pedal while using the throttle - hybrid pedaling and motor, like the pedelec. The controller determine the power that is being sent to the motor simply by how much you move the throttle. No complicated sensors are needed here. Twist-grip - How much you move the throttle will determine the speed of the bike. Thumb-press - Simple ON/OFF switch (No variable speed). You need to pay attention to the regulations at your place of residence. It is forbidden to use a throttle based e-bikes in quite a lot of countries. The e-bikes resembles a moped in it style of operation but it definitely not a moped in almost every parameter. Another cool option that some of the e-biks have is cruise control. I once rode an e-bike which had one. It keeps the amount of power that is sent to the motor at a constant value without holding the need to twist the throttle. It definitely can reduce the strain on the wrist.